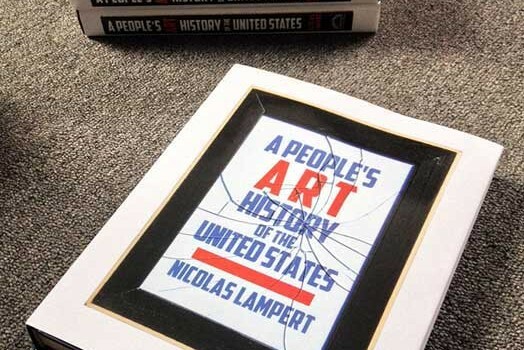 Here is another excerpt from A People’s Art History of the United States. This excerpt starts at the beginning of the chapter and discusses the Paterson Pageant in 1913 and the alliance of IWW strike organizers, silk workers, and Greenwich Village avant-garde artists. On June 7, 1913, an event occurred that completely blurred the boundaries between performance and protest. 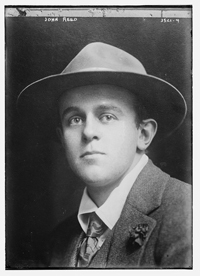 Journalist and poet John Reed led a procession of more than a thousand striking workers through the streets of Paterson, New Jersey, to board a special thirteen-car train destined for New York City. 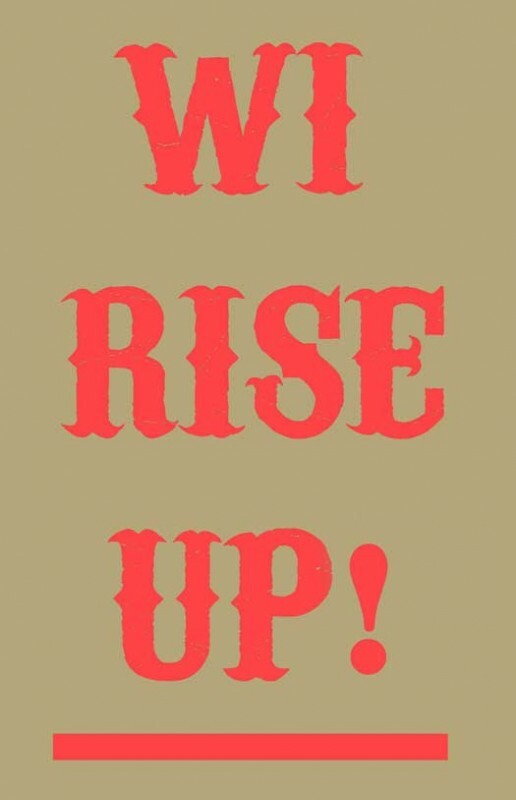 When they arrived in the city, they gathered for a rally at Union Square, followed by a march up Fifth Avenue toward Madison Square Garden, while the Industrial Workers of the World (IWW) band played “La Marseillaise” and “The Internationale.” On top of Madison Square Garden’s tower, the IWW initials glowed in red lights. Inside, the venue was transformed into a Wobbly hall, with red IWW banners, sashes, and ribbons throughout the building. The stage included a massive two-hundred-foot painted backdrop of a large silk mill, flanked by smaller mills. Up and down the aisles, volunteers walked, selling copies of the program, The Masses, and other radical publications. When the house lights went down and the curtain opened, Reed went to work directing the massive crew of striker-actors and actresses—playing the role of themselves, reenacting their struggle—the Paterson strike during the strike itself. Four months prior, 25,000 of their fellow workers had walked off their jobs in a strike that had crippled the Paterson silk industry. Workers had united over a number of issues that affected the lives of the ribbon weavers, broad silk weavers, and dyers. Together they protested the long hours (the ten-hour day), the three-to-four-loom system that replaced the double looms, the dangerous conditions of the dye houses, the “docking system” for female apprentices, and the different wage scales found within individual shops. Combined, they went on strike. IWW leaders had been invited in as strike organizers, arriving with much fanfare following the momentum of the Lawrence textile strike in Massachusetts in 1912, in which workers had won the majority of their demands, in part due to the leadership and tactics of the IWW. In Paterson, the IWW invited another group to help them in their efforts: Greenwich Village artists. This alliance led to the creation of a pageant—a theatrical performance to re-create recent history and a production to make history—to help raise money for a strike relief fund, help publicize the strike, and help inspire the workers to continue to hold out. Throughout the performance, the audience of 15,000 sang in unison with the cast and berated the police and the strikebreakers. On the main floor, a large central aisle led directly up to the stage, serving as a street for the cast of a thousand striking workers to march down, and was later utilized during a funeral scene. Here, the performers could stand side by side with the audience in unity, an action that further blurred boundaries: was the pageant indeed a drama, or had the strike itself been transported from Paterson to New York City? 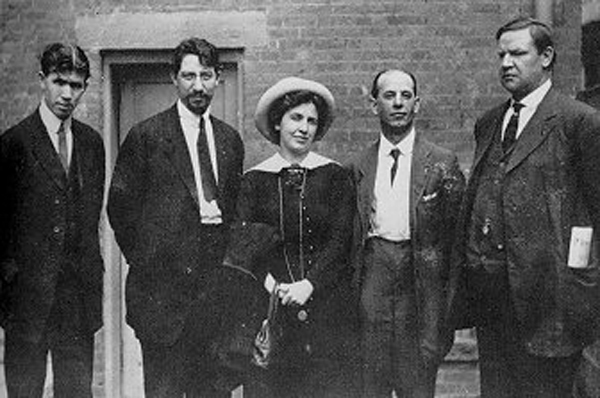 When IWW strike leaders Elizabeth Gurley Flynn, Bill Haywood, and Carlo Tresca addressed the crowd of 15,000, their speeches were similar, if not identical, to those they had given in the weeks and months prior in Paterson. Were they part of the drama or was it a recruitment pitch for the strike? These questions were what made the pageant so exceptional. It was also what made it so problematic. A pageant is not a strike, and vice versa, and the stakes were extremely high. A pageant could aid the workers’ demands or it could harm them. Additionally, it could either help or harm the fragile alliance of those who came together to put on the pageant—striking workers, IWW organizers, and artists. 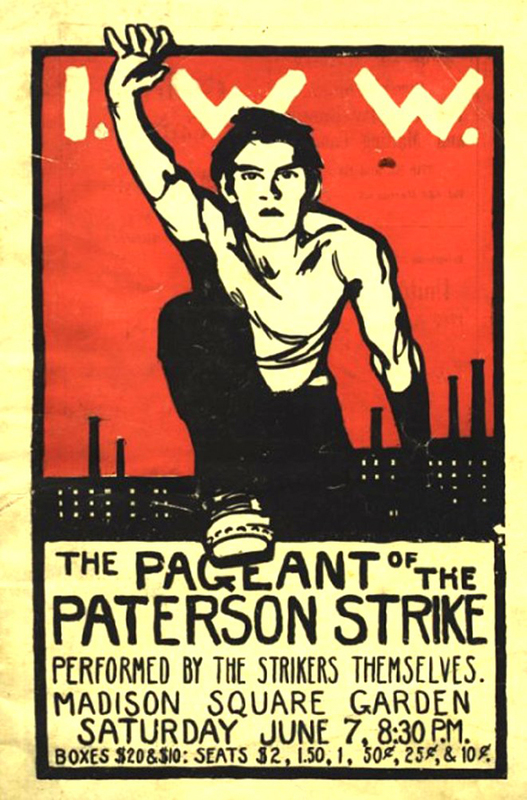 To understand the Paterson Pageant, one must first understand the IWW and what made the organization so unique and so critical. The IWW (nicknamed the Wobblies) was formed in 1905 in Chicago during a convention at Brand’s Hall, where more than two hundred socialists, anarchists, and labor leaders gathered, including William “Big Bill” Haywood (secretary of the Western Federation of Miners), Daniel DeLeon (leader of the Socialist Labor Party), Mother Jones (organizer for the United Mine Workers), Eugene V. Debs (socialist labor leader), and Lucy Parsons (labor organizer and widow of the Haymarket martyr Albert Parsons). 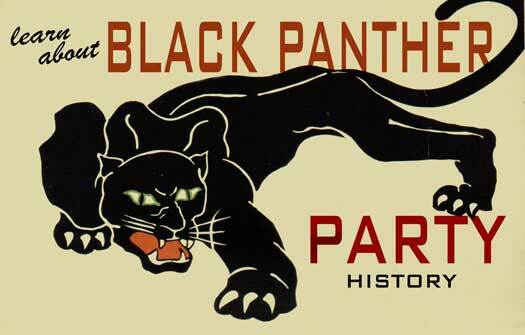 Those in attendance established a revolutionary union meant to confront the capitalist class. The opening sentence of the preamble read: “The working class and the employing class have nothing in common.” Instead of negotiating with the bosses, the IWW envisioned a new society based upon workers’ cooperatives and free of capitalism, bosses, exploitation, and racism. The IWW set out to recruit workers that the American Federation of Labor (AFL) largely ignored—the unskilled, recent immigrants, women, and workers of non-European heritage. The three years following the IWW’s 1905 founding convention were marred by internal strife and defections that nearly spelled the demise of the organization. Eugene Debs allowed his dues to lapse. For many, a major point of division was whether the union should be affiliated with the electoral process and function as the labor arm of the Socialist Labor Party. Anarchists within the IWW opposed this direction and argued that the organization should remain outside electoral politics. Instead, anarchists advocated that the IWW organize a revolutionary movement through industrial unionism and general strikes. The 1908 convention sealed the split when the IWW sided with anarcho-syndicalism. IWW culture helped to spread this message. The Wobbly publication The Industrial Worker wrote in 1913, “The strength of the IWW is not in its thousands of memberships—it is in its revolutionary ideas as they are translated into action against the employing class and all its institutions.” Revolutionary ideas were broadcast through the written word, but also through songs, poetry, soapbox speeches, theatre, graphics, cartoons, posters, slogans, and stickers—all of which became part of the IWW’s arsenal. Most significantly, IWW culture came from within. Culture was created from the bottom up. Hundreds, if not thousands, of different rank-and-file members created the culture—an approach that echoed the nonhierarchical structure of the union. Culture reflected the spirit of the Wobblies, but it also was part and parcel of IWW tactics. Culture kept a degree of unity and commonality among the many branches. It helped the IWW to maintain solidarity within, and promoted its goals far and wide to potential recruits, many of whom were migrant workers who traveled throughout the country in search of work. These migrant workers became the IWW artists, poets, and musicians. In Paterson, the IWW entered a labor conflict where their membership numbers were not strong. Instead of organizing their own rank and file, a handful of talented IWW organizers—chief among them Elizabeth Gurley Flynn and Bill Haywood—served as tacticians and speakers to help a strike already in progress. Their role was to help with strategies and to give speeches that would keep up the workers’ spirits during the hardships of the strike. This was critical, for workers who spoke out against their employers in public and through the press faced the threat of being blacklisted. IWW speakers from out of town did not face this threat. They could be arrested, but their livelihood was not on the line. Eventually, 9,000 workers in Paterson signed up as card-carrying IWW members, but this should not confuse the fact that prior to the strike Paterson workers had little to no prior affiliation with the IWW. I have come to Paterson not as a leader. There are no leaders in the IWW; this is not necessary. You are the members of the union and you need no leaders. I come here to give you the benefit of my experience throughout the country. 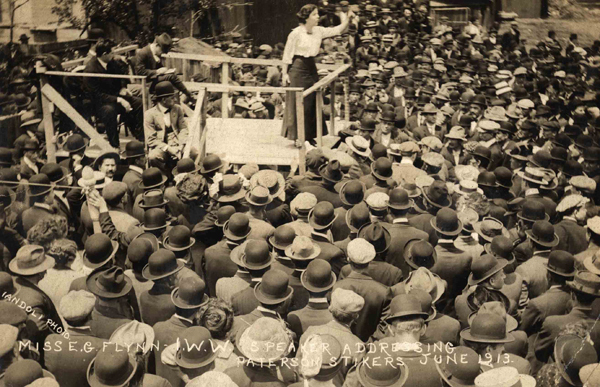 Elizabeth Gurley Flynn also addressed the workers. At one point she delivered more than nineteen speeches during a one-week span. Flynn, twenty-two years old at the time and already a veteran of labor struggles, having joined the IWW at age sixteen, helped break down the male-dominated labor movement by holding women-only meetings that encouraged women to assert their voices. To Flynn and the IWW, the strike represented workers taking control of their own lives—a path toward worker control of industry and society. However, not all of the Paterson silk workers shared these same aspirations. To many, the strike was about “looms, wages and hours.” Thus, the immediate task at hand was to win the strike, to convince the workers to stay out on the picket line, and to hope that the will of the owners of the silk industry would break first. This was a difficult task, for the strike had hurt manufacturers’ profits, but it did not completely stop production. While the factories were shut down in Paterson, the owners continued to operate their mills in eastern Pennsylvania. As the strike wore on, workers and their families faced a dire situation: some were on the brink of starvation, and many were dependent upon relief funds for their subsistence. Other problems also existed: the strike received little national coverage, and when it did it was often from a pro-business, corporate perspective. The Paterson press and the New York papers blasted the IWW, vilifying them as outside agitators who had come from out of town and whom the workers had foolishly followed against their better judgment. In response, the IWW and its allies in the bohemian artistic and intellectual subculture in Greenwich Village conceived of a project to counter the negative press attention around the strike: a pageant that recreated the strike for a New York audience. This production, they envisioned, could cast the struggle in a favorable light. It could also raise much-needed relief funds to sustain the strike. Artists in Greenwich Village admired the IWW, but they did so largely from afar. They knew about the IWW from the Lawrence textile strike but they did not know them personally. This changed due to Mabel Dodge’s weekly Wednesday-night salon gatherings. Dodge, a wealthy socialite who had spent the previous decade living in Florence, Italy, hosted weekly gatherings in her Greenwich Village home that attracted artists and writers, including those from the socialist publication The Masses and Emma Goldman’s publication, Mother Earth. Wobbly strike leaders also frequented many of these gatherings. 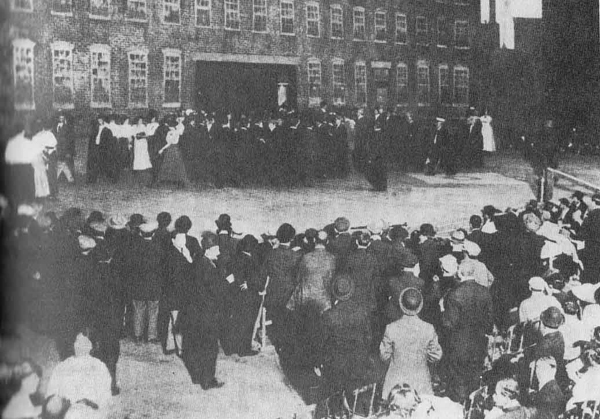 Dodge’s salons, open to all, gave artists the chance to meet the IWW leaders, including Bill Haywood, who frequented the events, and this is where the idea for a pageant developed, although it remains open to debate if Haywood or Dodge was the first to suggest it. Reed’s answer did not keep him out of jail. He was given twenty days, but made bail after serving only four. 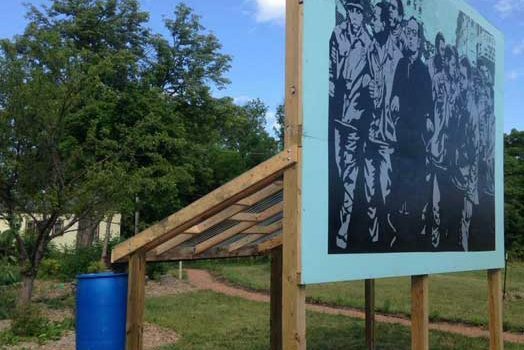 During these four days, however, he received a valuable lesson in life—the reality of jail, juxtaposed with the solidarity of being part of a movement, imprisoned with more than a hundred other strikers, including Haywood and Carlo Tresca. cover the steep production costs. 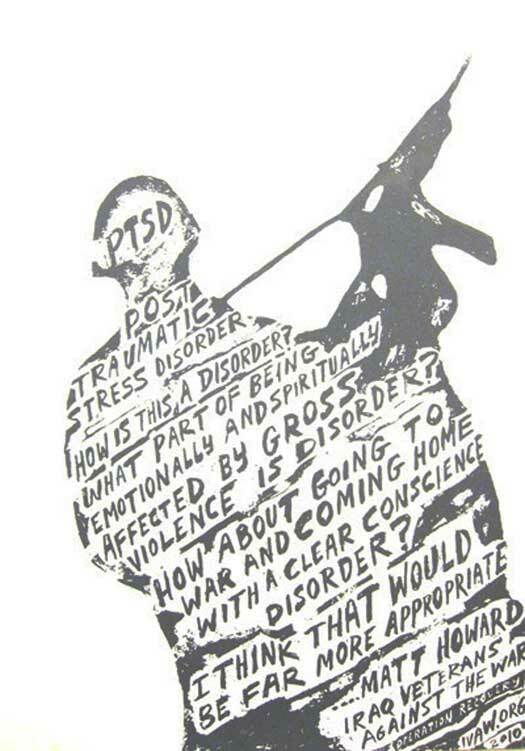 Chicago in War is a series of events, art shows, and performances that explores the continued rupturing of the traumas of war in everyday America. We are seeking your participation….